You can change the color or décor of any room to make it go from dull to cheery, drab to welcoming, or bright to relaxing. A fresh coat of paint or new wall covering can truly make all the difference. We at Master Painters can paint one or all of the rooms in your house, condo, office, townhouse, or business. We work quickly and as efficiently as possible. We know that painting can interrupt your life or leave your home disturbed, so we take that into consideration and get the job done fast and right the first time. And we always respect your property, both your personal property and the building itself. From extensive preparation work to a thorough cleanup, we will provide work you simply cannot help but love. Our clients trust us, and that’s why they come back to us and recommend us to their friends and family. Is the room wide or narrow? Dark colors seem to recede, while light colors advance. In order to make a narrow room appear wider, paint the end walls dark and the long walls light. Do you want to make a small room feel as if it is bigger or a big room feel as if it smaller? This applies for both small rooms and big rooms. In order to make a small room appear bigger, use lighter shades of paint. In order to make a large room feel smaller, be sure to select darker shades. Have you ever looked at your chosen color in different lighting? Always be sure to look at paint swatches during the day and at night. Is the color going to be uniform? Opt for a single color to shine in a space. Other colors should only be used as accents. Painting the inside of a home or office building means preparations. Here is how we get your interior ready and minimize the disruption to your daily routines. Your interior has its own needs, depending upon the room. Our bathroom painting services taking into consideration that your bathrooms have rather different environments from the rest of a home. We make sure that we only choose the type of paint that is able to hold up to dramatic changes in temperatures, exposure to chemicals, and a humid environment. Our bedroom painting services can create a relaxing space for you, or an individual space for your kids. Our kitchen painting services will refinish your kitchen walls, ceiling, floors and cabinets. We can even offer chalkboard paint (we recommend it for a pantry door) for jotting down the dinner menu, adding daily reminders, or making a grocery list. Or giving your kids something to do, rather than asking, again, where dinner is. Our dining room painting services can add a touch of elegance to this formal space. For living rooms, we help you balance the ideal atmosphere of warmth and comfort. Master Painters offers valuable suggestions for choosing the best paint colors for your particular space and taste. Since warm colors seem to advance instead of recede, choosing sunnier colors for large open rooms can make them feel more intimate. Neutral colors will complement, rather than compete with, expansive outdoor views. This makes nature’s beauty a more integral part of your living space. White paint on a living room’s molding and trim can reveal hidden details of design and craftsmanship. A northern exposure will fill a living room with cool bluish light, and it will beautifully intensify cooler hues. However, warm, yellowish light flooding a south-facing room can enrich shades of gold, green, and yellow in a living room. These areas need care, too! Your foyer is often the first impression that guests get of your home, so you want it to look inviting. We can handle even the tallest ceilings safely – so you don’t have to. 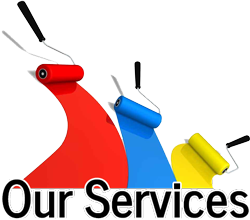 Master Painters will manage our painting projects in conjunction with what your business needs. We will always plan our work carefully and respect your schedule and the environment. We will be glad to meet with your facility management team in order to draw up a cleaning, painting, and/or maintenance schedule which fully meets your requirements in terms of the final results. We will agree on how we will communicate progress, and how we will complete your project on time and on budget. We will color match as needed, and will work with you to select products which are functional and durable, because we know how any disruption to your business can cost you money, and how important it is to keep your areas clean. And at the end of the painting project, you can always count on us to thoroughly clean up our work area and get it back to how you need it. We are business people, too, and we know you want to get back to what you do best! Contact us about flexible scheduling and scalable crews, in order to keep projects running smoothly no matter what your company has going on.